Teletronic began life in May 2001 as a companion site to Television Heaven. Whereas the original site was concerned with 'classic television shows', Teletronic concentrated more on contemporary shows. It was updated once a month and was one of the first television magazines on the Internet, with all new features added each month. Teletronic continued in the vein until around November 2005 when it started chronicling the history of television begining with the early pioneers and the history of the BBC. 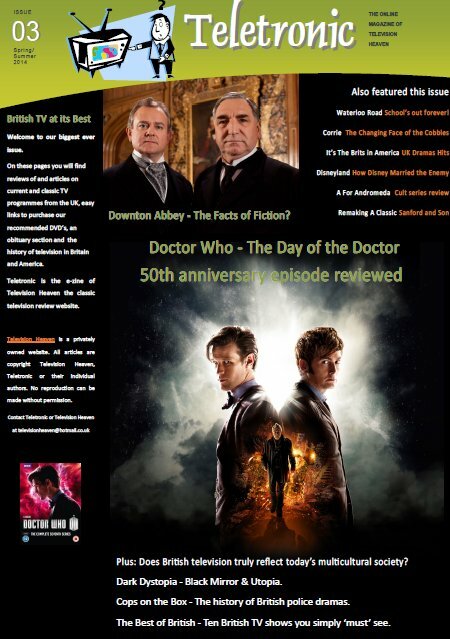 In February 2014, Teletronic became the name of Television Heaven's ezine. Now in 2019, television history has become its focal point once more. On the site you will find a comprehensive history of the years of discoveries that led to the development of television, the early days of BBC Television, the advent of commercial television in Great Britain, the development of different genres, the vast array of products that became available as a result of television, the words of the actors and technicians involved in television, how so many classic TV shows came to be lost and the development of television from around the world. Teletronic is a privately owned non-profit making site and does not sell DVD or videos directly and is not affiliated with any other Website using the name Teletronic or similar to sell recordings of shows that have not been officially released. This is an infringement under copyright law and sellers and buyers of this type of material could leave themselves open to criminal proceedings. Instead, we use links to reputable online stores purely to offset the running cost of this site. If you wish to contact Teletronic because you are a so-called 'web developer' and you can improve our Search Engine Optimisation, get us top ranking on Google or fix our allegedly multiple broken hyperlinks - save yourself the bother. Those emails are deleted unread on a daily basis. However, if you have a website about television, radio, movies or general nostalgia and would like a reciprocal link please email the above address. All reciprocal links will go on our Links Page. Teletronic does not offer free advertising or 'articles in exchange' for links where the linked site does not fall into our usual link category.